What is pool and spa automation? What can pool automation do? What is pool and/or spa automation? Swimming Pool and Spa automation is a way to simplify the use of your pool or spa. You probably already have the simplest form of automation, a time clock. You could go out every morning and turn on your swimming pool circulation pump and at the end of the day go back out and turn it off. But who wants to add another thing to remember to an already busy schedule? And what about the electricity bill when you forget to turn it off for 5 days? So to make your life less complex while still ensuring that your pool water gets filtered properly each day, you have a time clock that automatically turns your pump on and off each day. Whew! One less thing to worry about. Every swimming pool I have ever visited in Huntington Beach and Fountain Valley since 1990 has some type of time clock for the filter pump. Another example of Automation you probably already have if your pool or spa has a heater, is the pool heater thermostat. You could turn your pool heater on and then run out every hour (or 5 minutes for your spa) to check the water temperature, and then turn it off when the desired temperature was reached. Don’t forget getting out of the spa to turn the heater back on as your spa cooled down. This could get old fast, so instead there is a temperature sensor built into the heater, and a thermostat that can be set to whatever temperature you like. You just turn the heater on, set the temperature, and your heater automatically runs until the spa water is the perfect temperature. It then turns off, but turns back on to maintain the set temperature while you are enjoying a nice soak. While these two examples demonstrate perfectly how automation simplifies the use of your pool or spa, there is much more that can be done. Just about any function that is done manually, can be set up to be run by automation. Switches and valves that actuate pool lights, fountains, waterfalls or your hot tub, can all be automated. In many cases, yard lights, fire bowls and other backyard accessories can be connected to your pool automation system. Why would I need pool automation? Most people install automation so they don’t have to trudge out to the far corner of their yard (where the pool equipment usually is located) to adjust the valves or switches required to turn on their hot tub, heater, lights or water features. This is especially true of after dark spa use. Who wants to wander around wet and barefoot in the dark, possibly through dirt, gravel or vegetation, to turn the spa on or off? And why is it there are never lights at the pool equipment pad? Many times, even if you make it through the jungle of your backyard vegetation to the pool equipment, and can see the switches and valves, you may not be able to remember which ones need to be adjusted and how. An added bonus to many modern pool automation systems is remote access. This can be helpful in several ways. Imagine being stuck in traffic on the way home from work, and thinking ” a good soak in the jacuzzi is what I need when I get home.” Instead of trying to get your spouse or one of your children on the phone to flip the valves and turn the heater on, or waiting until you get home to start the process yourself (which means more waiting once the heater is started), you can simply press a button on an app on your phone, and enjoy as soon as you walk in the door. Another advantage to remote access is that if you use a pool service company, diagnostics are available remotely, so if there is a problem, your pool tech can check your system and possibly resolve simple issues without having to make a service call. Even if he does have to come out to check things, he will have a better idea of what he will be dealing with, which could lead to quicker problem resolution. How can I use pool automation? This is where the true genius of pool automation shines. For years (like 30+) pool automation systems came with a control panel that mounted somewhere in your house. More recently, wireless remotes have been added to mix. There are also computer interfaces. But the simplest (and in my opinion, best) option came when the major manufacturers of pool automation- Hayward, Pentair and Jandy- came out with apps for your phone. No remote to find, no batteries to change, just reach into your pocket and pull up the app for full control of your pool and spa. A wireless home internet router will make this work. And for those of you who like to be on the cutting edge of things, voice control through your home smart speaker (Amazon Echo, Google Home and others) is now available with most pool automation packages. How can I get pool automation? Behind the elegantly simple interface of the pool automation phone app is some relatively sophisticated hardware. A control box that contains the brains of the system and banks of relays is mounted at your pool equipment pad. It may also include a sub-panel. The electrical power to each piece of your pool equipment needs to be run through this box, along with various sensors and low voltage control wiring. Connections to your home computer network will need to be set up. 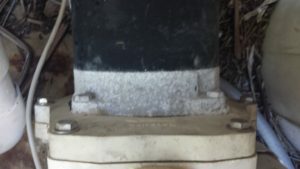 Valve actuators may need to be installed on plumbing valves. Unless you are an amateur electrician or serious do-it-yourselfer, the best way to get swimming pool automation is to have a pool professional install it. If you are in Huntington Beach or Fountain Valley, California, I would be happy to stop by and help you pick out an automation system best suited for your pool/spa. This entry was posted in Controls on March 12, 2018 by Miller Pool Service.